It’s been called the keto diet, the ketogenic diet, the low-carb diet and the low carb high fat (LCHF) diet. Whatever you call it, a ketogenic diet works if you can stick to it. When you are on a low-carb diet, your body produces ketones in the liver to be used for energy, thus the name ketogenic diet. In contrast, when you eat a diet high in carbs, your body will produce glucose and insulin. Glucose is easily and readily converted to ATP to be used by the body for energy. Insulin is produced to help process the glucose flooding your blood stream. When glucose is readily available for your body to use as a primary source of energy, fats are no longer needed and are stored. By lowering your carbohydrate intake, you force your body into a state of ketosis, where it will seek out fat stores to burn in place of carbohydrates. Ketosis is the natural process by which the body burns fat stores to help your carbohydrate deprived body survive. When in a state of ketosis, your body will begin to break down the fats in the liver to produce ketones for energy. 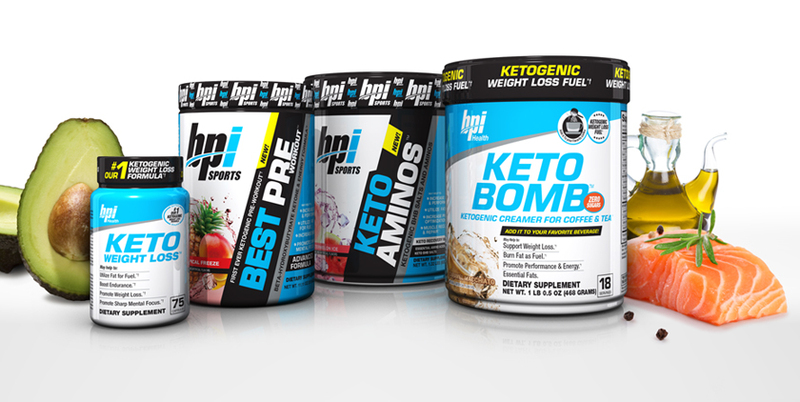 When beginning a ketogenic diet or taking your current keto routine to the next level, BPI Sport’s line of keto supplements can help to give you the added edge you need to reach your goals. Supplementing with the BPI keto line is an easy and convenient way to support your keto diet. BEST PRE WORKOUT™ — This ketogenic pre-workout supplement helps transition the body from using glucose for fuel to burning fat for fuel. It contains both medium chain triglycerides (MCTs) and beta-hydroxybutyrate (BHB) salts. KETO BOMB™ — Get instant and sustained energy from electrolytes and MCTs in this first-ever, ketogenic creamer. Keto Bomb™ comes in two delicious flavors: French Vanilla Latte and Caramel Macchiato. KETO WEIGHT LOSS™ — By combining caffeine, BHB salts, MCTs and guarana, Keto Weight Loss™ is designed to increase energy, boost endurance and enhance focus. KETO AMINOS™ — This ketogenic amino acid formula delivers MCTs, BHB salts, and citrulline. MCTs promote energy, BHB salts support performance and citrulline helps promote blood flow. BHB Salts — What the ketosis community call exogenous ketones, BHB salts consist of sodium, potassium and beta-hydroxybutyrate. MCTs — Medium-chain triglycerides are saturated fatty acids that may have many health benefits, including improved weight management. Citrulline — After supplementation, the amino acid citrulline is converted to arginine in the kidneys. Arginine helps improve blood flow. Guarana — A plant in the Maple family that has high concentrations of caffeine, making it very popular as an energy and weight loss supplement.